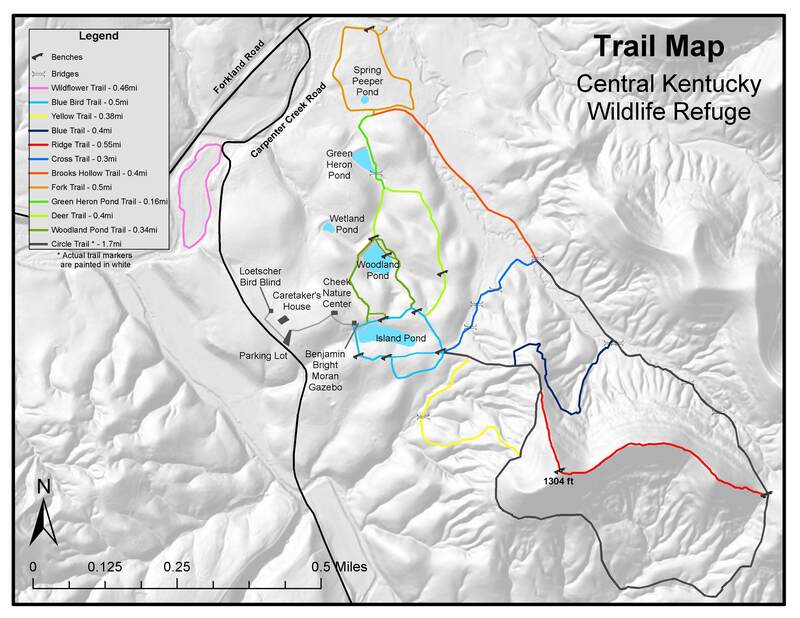 The refuge has five main trails. Each trail is identified below with its own color, level of difficulty, and trail distance. BLUE TRAIL (Blue, Difficult, 0.4 mi.) – A short path off Circle Trail on a shady ridge, it was the first trail established at the Refuge. BLUEBIRD TRAIL (Light Blue, Easy, 0.5 mi.) – Circling Island Pond, the trail goes through a meadow planted with warm season native grasses. BROOKS HOLLOW TRAIL (Light Green, Easy, 0.7 mi.) – Beginning at Woodland Pond dam, the trail passes alongside Green Heron Pond and crosses Brooks Hollow Creek. CIRCLE TRAIL (Red & White, Moderate, 2.2 mi.) – Encircles Huckleberry Ridge and traverses some lower slopes. CROSS TRAIL (Medium Blue, Easy, .3 mi.) — Connecting trail between Brook Hollow and Island Pond Meadow. DEER TRAIL (Dark Green, Easy, 0.3 mi.) – A pleasant, easy walk through the woods. FORK TRAIL (Orange, Easy, 0.6 mi.) – A loop trail circling a warm season native grass meadow with a spur to the North Rolling Fork River. Caution: never enter a swiftly moving stream. GREEN HERON POND TRAIL (Lt. Green, Easy, .16 mi.) — Gentle trail crossing Woodland Pond Dam and connecting to Deer Trail. RIDGE TRAIL (Red, Strenuous, 0.6 mi.) – Takes you up and down three crests of Huckleberry Ridge and is well worth the climb. WILDFLOWER TRAIL (Blue, Easy, 0.5 mi.) – A loop trail near the bridge on Carpenter Creek Rd., this trail features a cliff side walk with an exceptional display of spring wildflowers. WOODLAND POND TRAIL (Green, Easy, 0.4 mi.) – A loop off Bluebird Trail, with a beautiful view of Woodland Pond. YELLOW TRAIL (Yellow, Moderate, .38 mi.) — A gently rolling trail with a steep slope that connects to Circle Trail. Is there a trail to a waterfall? Thanks for your question. Unfortunately at this time there is not a waterfall trail. We are working on plans for the future to possibly open a new waterfall trail.